Want to use the FireHydrant API? You'll need a bot account for that. FireHydrant allows you to access our JSON API with the concept of a Bot user. A bot user is a separate entity in your organization that can perform actions just like a user can. When a bot is created, we also include an API token that is then authenticated in our API when any action is called. If you are logged in, the left side will contain a "Bot Users" page if you are organization owner. Once on this page, click the "New" link. You'll then be taken to a page to add a Name and Description to this bot. These are for your reference and don't impact how the API is used. Click "Save" to create the bot. After clicking save, you'll be redirected back to the bot users page. Your token will be displayed only once. 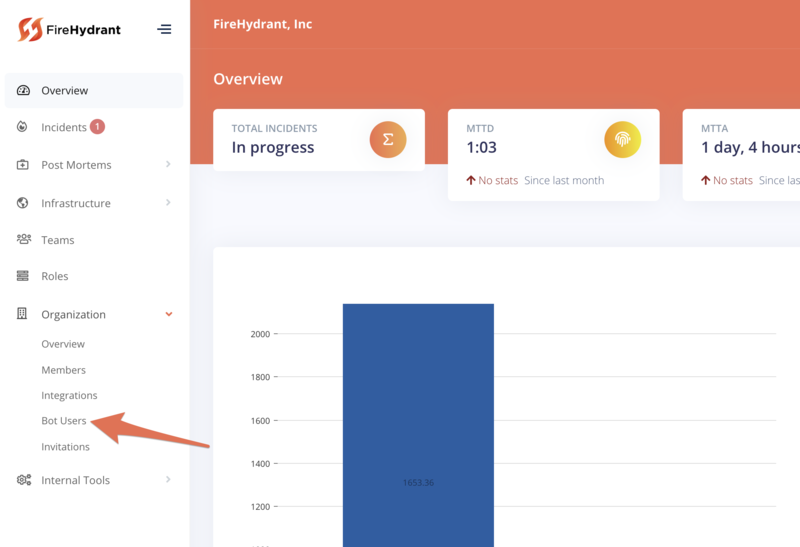 Make sure you copy this and keep it somewhere safe, as this token gives access your organizations FireHydrant account. This token grants access to the FireHydrant API on behalf of your organization. Please take proper steps to make sure this token doesn't get into the wrong hands.